Indeholder "Preface", " Organization", " Acknowledgments", "Contents", "Introduction", " 1.1 Overview", " 1.2 Syntax Notation", " 1.1c Evolution of C++", " 1.2c Acknowledgements", "Lexical Conventions", " 2.1 Tokens", " 2.2 Comments", " 2.3 Identifiers", " 2.4 Keywords", " 2.5 Literals", " 2.1c Implementation Dependencies", "Basic Concepts", " 3.1 Declarations and Definitions", " 3.2 Scopes", " 3.3 Program and Linkage", " 3.4 Start and Termination", " 3.5 Storage Classes", " 3.6 Types", " 3.7 Lvalues", " 3.1c Name Spaces", " 3.2c Numerical Limits", "Standard Conversions", " 4.1 Integral Promotions", " 4.2 Integral Conversions", " 4.3 Float and Double", " 4.4 Floating and Integral", " 4.5 Arithmetic Conversions", " 4.6 Pointer Conversions", " 4.7 Reference Conversions", " 4.8 Pointers to Members", " 4.1c Arithmetic Conversions", "Expressions", " 5.1 Primary Expressions", " 5.2 Postfix Expressions", " 5.3 Unary Operators", " 5.4 Explicit Type Conversion", " 5.5 Pointer-to-Member Operators", " 5.6 Multiplicative Operators", " 5.7 Additive Operators", " 5.8 Shift Operators", " 5.9 Relational Operators", " 5.10 Equality Operators", " 5.11 Bitwise AND Operator", " 5.12 Bitwise Exclusive OR Operator", " 5.13 Bitwise Inclusive OR Operator", " 5.14 Logical AND Operator", " 5.15 Logical OR Operator", " 5.16 Conditional Operator", " 5.17 Assignment Operators", " 5.18 Comma Operator", " 5.19 Constant Expressions", "Statements", " 6.1 Labeled Statement", " 6.2 Expression Statement", " 6.3 Compound Statement, or Block", " 6.4 Selection Statements", " 6.5 Iteration Statements", " 6.6 Jump Statements", " 6.7 Declaration Statement", " 6.8 Ambiguity Resolution", "Declarations", " 7.1 Specifiers", " 7.2 Enumeration Declarations", " 7.3 Asm Declarations", " 7.4 Linkage Specifications", " 7.1c Linkage Specifications", " 7.2c Type-safe Linkage", " 7.3c Limitations", "Declarators", " 8.1 Type Names", " 8.2 Meaning of Declarators", " 8.3 Function Definitions", " 8.4 Initializers", " 8.1c Pointers to Members", "Classes", " 9.1 Class Names", " 9.2 Class Members", " 9.3 Member Functions", " 9.4 Static Members", " 9.5 Unions", " 9.6 Bit-Fields", " 9.7 Nested Class Declarations", " 9.8 Local Class Declarations", " 9.9 Local Type Names", " 9.1c Interfaces", "Derived Classes", " 10.1 Multiple Base Classes", " 10.2 Virtual Functions", " 10.3 Abstract Classes", " 10.4 Summary of Scope Rules", " 10.1c Single Inheritance", " 10.2c Multiple Inheritance", " 10.3c Multiple Inheritance and Casting", " 10.4c Multiple Inheritance and Implicit Conversion", " 10.5c Virtual Base Classes", " 10.6c Virtual Base Classes and Casting", " 10.7c Single Inheritance and Virtual Functions", " 10.8c Multiple Inheritance and Virtual Functions", " 10.9c Instantiation of Virtual Functions", " 10.10c Virtual Base Classes with Virtual Functions", " 10.11c Renaming", "Member Access Control", " 11.1 Access Specifiers", " 11.2 Access Specifiers for Base Classes", " 11.3 Access Declarations", " 11.4 Friends", " 11.5 Protected Member Access", " 11.6 Access to Virtual Functions", " 11.7 Multiple Access", " 11.1c General Ideas", " 11.2c Per Class Protection", " 11.3c Access Control", "Special Member Functions", " 12.1 Constructors", " 12.2 Temporary Objects", " 12.3 Conversions", " 12.4 Destructors", " 12.5 Free Store", " 12.6 Initialization", " 12.7 Constructors and Destructors", " 12.8 Copying Class Objects", " 12.1c Temporary Elimination", " 12.2c Access Control and Special Functions", " 12.3c Summary of Member, Friend, and Special Functions", "Overloading", " 13.1 Declaration Matching", " 13.2 Argument Matching", " 13.3 Address of Overloaded Function", " 13.4 Overloaded Operators", "Templates", " 14.1 Templates", " 14.2 Class Templates", " 14.3 Type Equivalence", " 14.4 Function Templates", " 14.5 Declarations and Definitions", " 14.6 Member Function Templates", " 14.7 Friends", " 14.8 Static Members and Variables", "Exception Handling", " 15.1 Exception Handling", " 15.2 Throwing an Exception", " 15.3 Constructors and Destructors", " 15.4 Handling an Exception", " 15.5 Exception Specifications", " 15.6 Special Functions", " 15.7 Exceptions and Access", "Preprocessing", " 16.1 Phases of Preprocessing", " 16.2 Trigraph Sequences", " 16.3 Macro Definition and Expansion", " 16.4 File Inclusion", " 16.5 Conditional Compilation", " 16.6 Line Control", " 16.7 Error Directive", " 16.8 Pragmas", " 16.9 Null Directive", " 16.10 Predefined Names", " 16.1c CA+ Constructs versus #def ine", " 16.2c Compatibility", " 16.3c Classic C Preprocessing", "Grammar Summary", " 17.1 Keywords", " 17.2 Expressions", " 17.3 Declarations", " 17.4 Declarators", " 17.5 Class", " 17.6 Statements", " 17.7 Preprocessor", " 17.8 Templates", " 17.9 Exception", "Compatibility", " 18.1 Extensions", " 18.2 C++ and ANSI C", " 18.3 Anachronisms", "ANSI/ISO Resolutions", "Index". This was very useful when it was published, but I don't know if I'd use it now if I were a practicing C programmer: the language has changed, and the STL and template (meta)programming are the current techniques worth knowing. 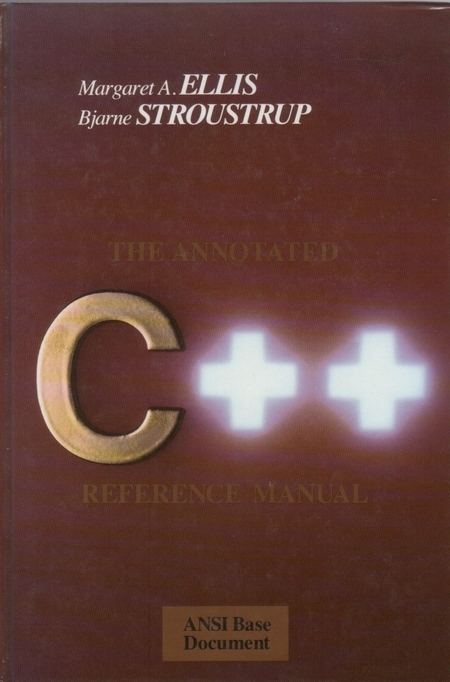 This book definitely isn't light reading, but it will give you a very clear pciture of C++. It is a little old so some of the minor points might have changed, but it is at least worth having on the shelf.